We are engaged in several field projects, which involve focused examinations of hard tissue remains and observational studies of living primates from well documented wild populations. See below to learn about some of our projects. To conduct skeletal research on these materials to improve our understanding of the developmental biology, life history and health of mountain gorillas, for the insights this can provide into their evolutionary and conservation biology. The project is co-led by Dr. Shannon McFarlin of The George Washington University and Dr. Antoine Mudakikwa of the Rwanda Development Board's Department of Tourism and Conservation, with core scientific partners from Dian Fossey Gorilla Fund International (Karisoke Research Center), Mountain Gorilla Veterinary Project, Institute of National Museums of Rwanda, and New York University College of Dentistry. The collaboration has also benefited greatly from the contributions of other scientists from the Smithsonian's National Museum of Natural History and the University of Indianapolis, and funding from the National Geographic Society's Committee for Exploration and Research, The Leakey Foundation, and National Science Foundation. Thus far, our team has recovered the skeletal remains of more than 100 mountain gorillas, many of whom were observed in life by Dian Fossey and other staff of the Karisoke Research Center. This collection is now curated at the Karisoke Research Center in Musanze, Rwanda, under the ownership authority of Rwanda national parks. It is planned that the collection will be opened for study in late 2013, although we can accommodate researchers on a limited basis in the interim. For an abbreviated catalog of the collection, please check out our Resources page. Skeleton of an infant mountain gorilla. From National Geographic Magazine, March 2009. A central challenge of great importance to human origins research is to understand how evolution has shaped the unique life history strategies of modern humans and our closest living relatives, the great apes. To address this problem, a major focus has been on establishing relationships between morphological development (recoverable from extant and fossil organisms) and key life history traits measured in modern contexts. Long-term data accumulating across study sites is demonstrating more diversity than originally recognized in the life history strategies of wild great apes. However, our knowledge of the physical ontogenies of known-aged great apes remains overwhelmingly derived from captive studies, with a few notable exceptions. Ultimately, we expect this research will contribute to a more comprehensive understanding of how and why dental, somatic, reproductive, and behavioral developmental milestones covary within and among closely related great ape taxa, and shed important light on how life history variation may be mediated by trade-offs affecting offspring growth. Results will also have broader significance for our ability to accurately interpret the life history and evolutionary significance of developmental parameters reconstructed from a patchy yet increasingly diverse human fossil record. 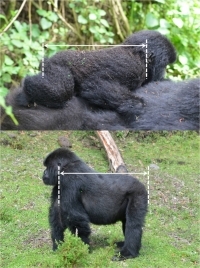 J. Galbany collecting photogrammetry data from Karisoke mountain gorillas.